of our most cherished childhood events are disappearing. 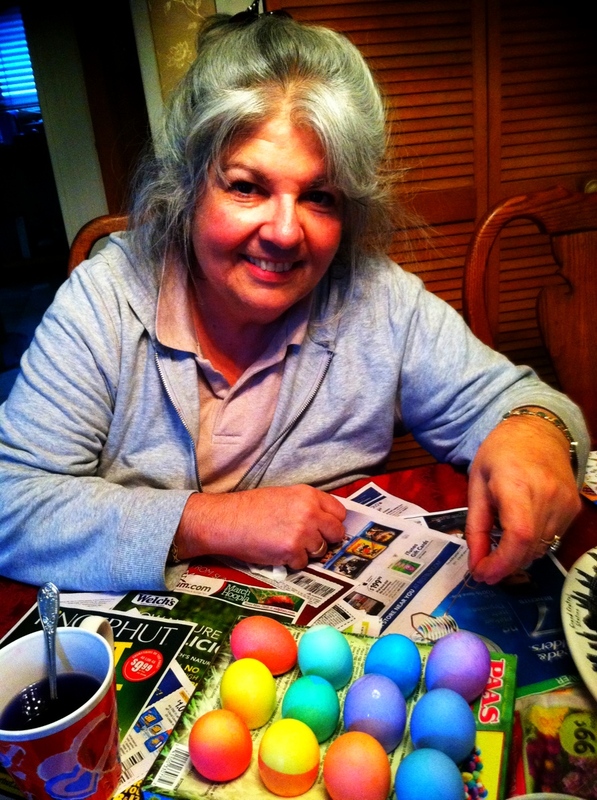 Every year in the days before Easter, my sister Maria and I would engage in the egg dying event. My mother would boil at least two-dozen eggs. The familiar box of PAAS food coloring with the special stickers of bunnies and flowers were a special addition to the fun. My mother would take her older porcelain cups, some with chips or stains on them that she saved year after year for this occasion and fill them with water. Then she would add the apple cider vinegar to each cup. My mother would put newspaper on the kitchen table to absorb the spills. Then Maria and I would take the special crayon, included in the box of PAAS and write names on the hard boiled eggs. We would have MOM, DAD and our names. Since Maria had all the artistic talent between us, she would often draw a design on the eggs as well. We would drop the magical colored tablets into each cup and watch the water turn into a rainbow of colors. Maria always took the cup with the blue water, because it was her favorite color. There was a metal egg holder that would carefully lift the eggs out of the cups when the color had absorbed into the eggs. I was always impatient and would remove the eggs too soon. Maria was patient and deliberate and her eggs had the best tint. The words we wrote on earlier would emerge from the colors and identify who it would belong to. The eggs would dry on the cardboard cut-out from the PAAS box. My mother would box artificial grass from the store and we would put the colorful eggs in a yellow basket in the grass and jellybeans would be scattered around them. The eggs sat in the basket for at least two weeks — we never thought of putting the basket in the fridge. After Easter, we would have a lot of egg salad sandwiches. We never got sick from the old, room-temperature eggs; it was the miraculous 1950s. In thinking back on my childhood, I can smile with the warmth of the memory. I took that memory with me when my children were growing up. 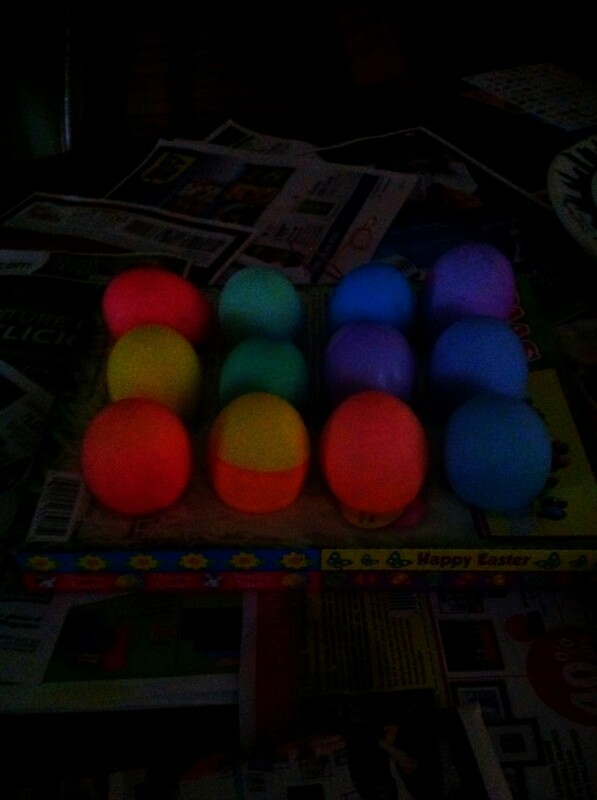 With my girls, we dyed the eggs in the exact same fashion. Only in the recent times, my Roseanne was the careful artist and Katie was like me, a little hasty. In their memory of this event, my surrogate daughter Clare (Clare-Bear) would often join us to dye the eggs and share in the fun. The tradition halted last year, with neither of my girls available to continue the tradition. One was planning a wedding, the other working too hard. 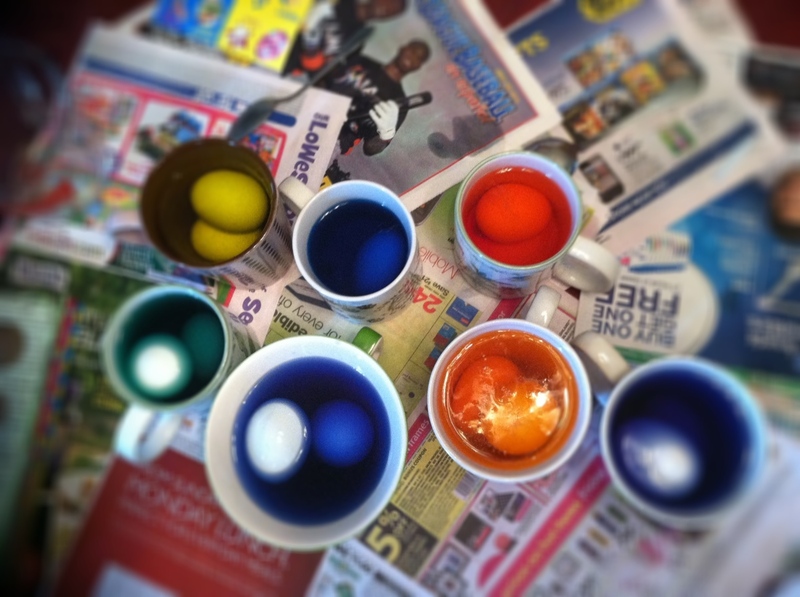 I would like to think that the ceremony of egg dying will return one day to our family, and I know none of us would ever think of buying pre-dyed eggs in the store. I would like to share my recipe for deviled eggs that my husband Mike enjoys. The one big change in the event is that now we refrigerate the eggs, since everyone tells us without that we might be poisoned. I don’t believe them.